a tale of a magic trip. the skipper brave and cute. for an 8-day tour, an 8-day tour. the happy ship was tossed. and hoped we wouldn’t get lost, and hoped we wouldn’t get lost! that sailed for a long, long time. The clank of the buckle on my sailing harness makes me smile. Why you ask? Well here I am hanging onto the cabin handholds trying to stay upright while gazing at family photos on the wall, as I layer up for my 3am to 6am shift at the helm. Donning long pants and long sleeves, followed by foul weather gear, my harness, PFD, hat, and safety tether, I’m nearly ready. Once I pour my coffee, then I’ll head up to the cockpit, get the latest update from the current watch, check the weather, heading, speed and conditions, then I’ll clip in and take over the helm. When Marty and I bought Happy Dance and started making plans to live aboard, we also began thinking about the overall route that we’d take. We knew that our ultimate destination was ‘sunshine’, which meant getting the boat from the NW to the southern latitudes. The run down the Pacific Coast of Washington and Oregon are known for their ugly weather, so we’ve thought about this particular offshore passage for many months! 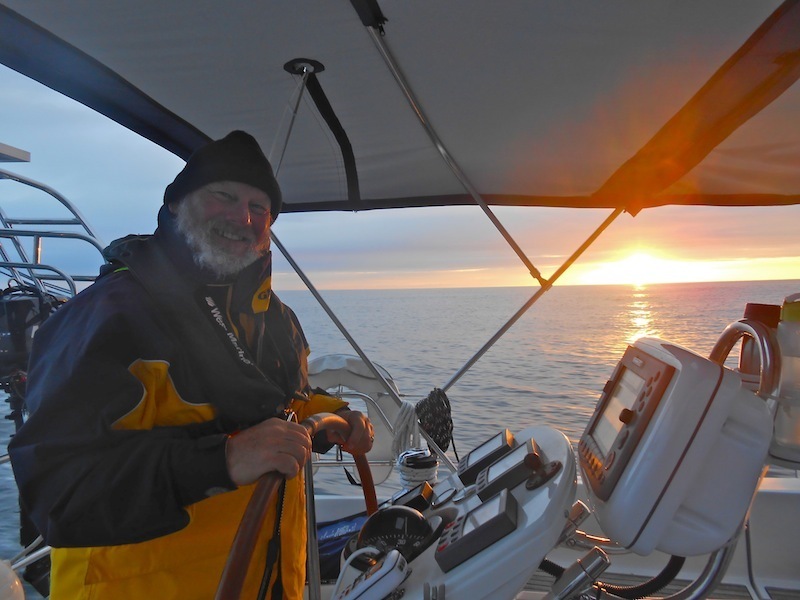 Then we added a summer of cruising in Alaska, so the length of our offshore passage grew to over 1200 miles! Planning, timing, patience, more planning, and the gumption to go when it’s time to go; these all worked together to make our journey a safe one. After sitting in the rain in Ketchikan for a week monitoring the weather forecasts while waiting for the right moment to push off the docks, we finally saw a window of opportunity and knew it was time to go! We quickly said our goodbyes to friends from Sail Alaska that were still at the dock, then we donned our foulies, untied the lines and we were off. I think the hardest part of the whole journey was pulling out from the dock! Under threatening skies, with winds on our nose, and some stand up and take notice rollers coming in off the ocean, we headed down Clarence Strait to Dixon Entrance. We left the dock at around 10:30am so we had nearly 12 hours to get out of the heavier boat traffic in the inshore areas before dark. Sailing at night is a sensation that’s hard to express. Some nights are pure magic; when the full moon shines silver on the water, the boat wake is lit with phosphorus; the rollers raise and lower the boat gracefully; so you sit back in awe and enjoy the feeling of being alone on the vast ocean. Other nights are intense in a different way; when the fog is thick, the waves are steep and irregular, the radar screen is full of “targets” to avoid (even though it’s you that feels like the target! ), the dampness soaks into your bones – those are the nights that make you question your sanity for being out there! But I’m jumping ahead in this tale of our first offshore passage. 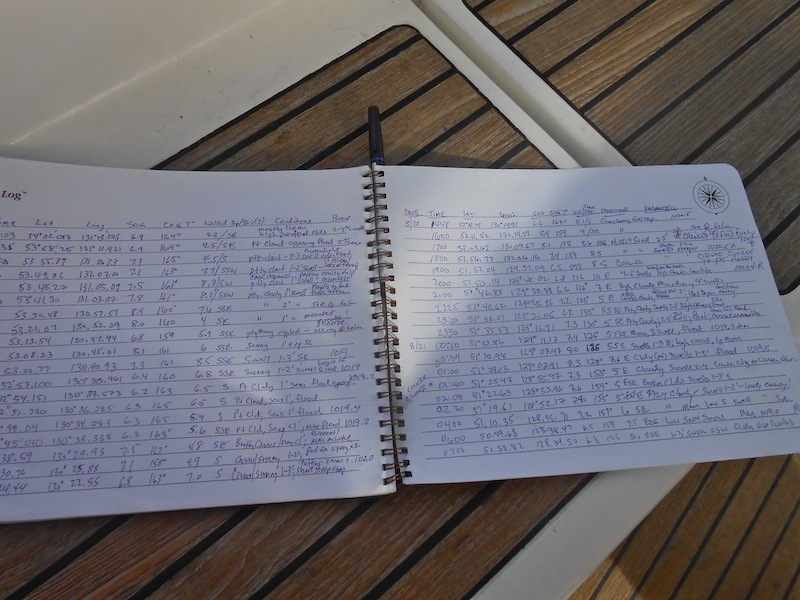 Instead of giving you a wave-by-wave, hour-by-hour logbook account, here are a few memorable moments and some random thoughts! Bogies off the starboard bow! 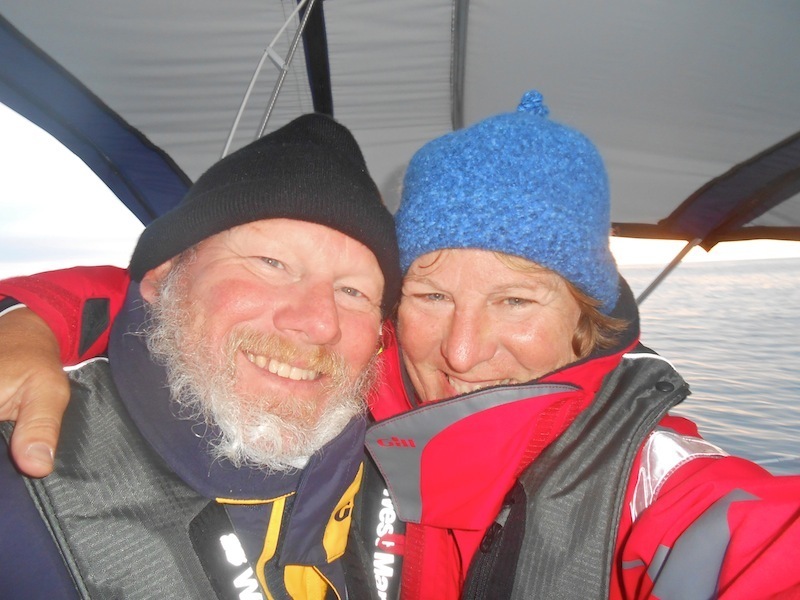 On our first night as we cleared Dixon Entrance and started working our way down Hecate Strait, we ran smack into a fishing fleet of about a dozen boats just off Rose Spit, in a shallow area that is a popular commercial fishing spot. Marty and I were below trying to sleep when the engines were cut back suddenly, so we quickly went on deck to see what was happening. We were surrounded by moonlight, fishing boats, and what seemed like a bazillion twinkling lighted buoys. A fishing boat had just crossed our bow, and was laying his string of crab traps. Phyllis was at the helm, and she’d thought it might be a net that was being let out, so had altered our course to avoid it. When we realized it was a line of crab traps, it took all of us with flashlights shining at the numerous buoys to be able to work our way out of the maze of little blinking lights! When we finally did get out of the pots, something still didn’t seem right, so we asked Phyllis what our heading was….and oops! In all the confusion she had turned 180 degrees off course and was heading back to Alaska! It’s amazing how easy it is to get turned around in the dark. Some other intense night watches were both when we were engulfed in fog. One night I was watching the radar and trying to determine what direction a certain “blip” was heading. I figured it was a fishing trawler because they go so slow and change direction so often that it’s really hard to track their course on the radar. 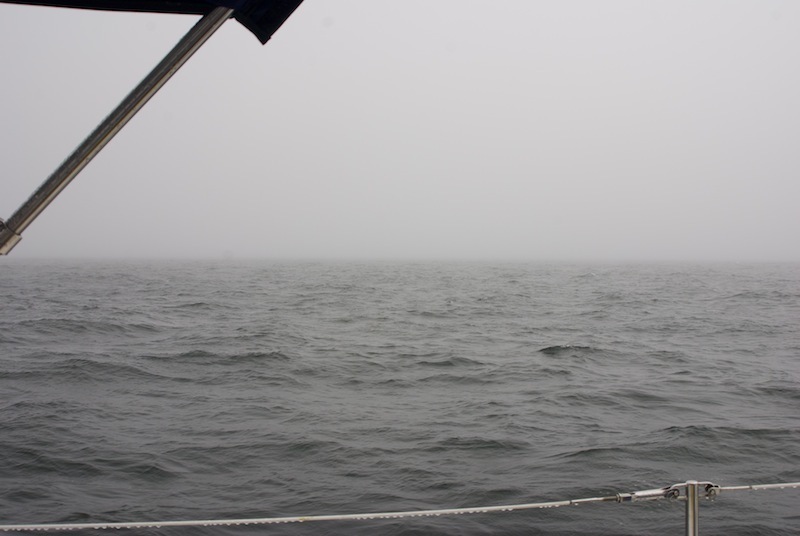 While trying to keep a mile between Happy Dance and the other boat, a fast moving little powerboat that was not showing on the radar suddenly came out of the fog heading straight for us! I quickly took the boat off auto-helm and made a hard turn to starboard away from the oncoming boat. 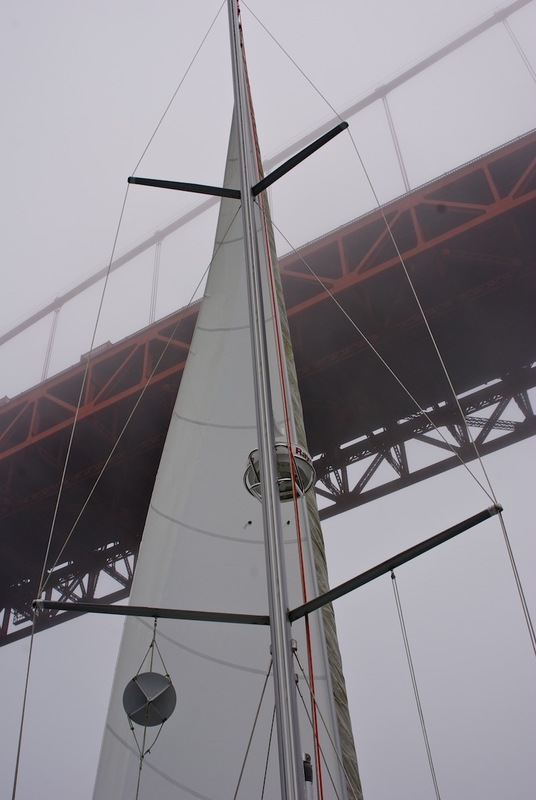 He also turned hard to starboard and just as quickly as he had appeared, he disappeared back into the fog! Quite an adrenalin rush I can tell you, and my hands were shaking! 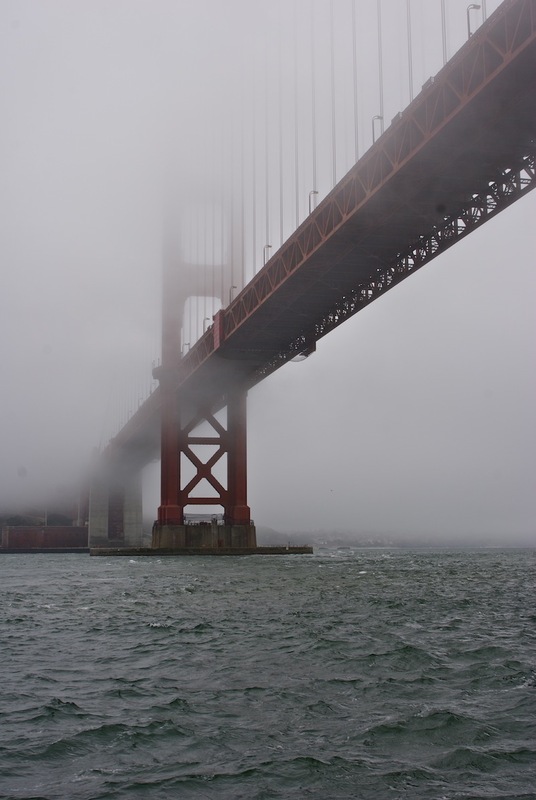 Fog…I hate fog…and this day we actually had pretty good visibility! The next thing to appear in the fog was the elusive trawler, though he was at least moving very slowly so we had room to avoid each other. After recovering from those two close encounters, now we (everyone is on deck by now, ha) started hearing the deep ominous sound of a freighter’s foghorn. Holy crap! I wanted to verify his position and heading so I tried calling him on the VHF radio – no answer. Since he appeared to be heading on our same course and traveling much faster than us, we made a 90-degree course change to get out of his way. Finally he passed us by, and the fishing boats started thinning out too, as we headed farther and farther off shore….phew! I hate fog!!! Incoming!! Another encounter in the same theme of being attacked by something you can’t see was when we started hearing the Navy calling over the radio to announce latitude and longitude coordinates of the areas where they were conducting live fire exercises! There were two or three Navy units within 20-30 miles of our position. We called the closest unit on the radio to advise them of our location, so that we could be sure not to be in their 10-mile shooting radius! A while later we started hearing the BOOM, BOOM, BOOM of large artillery fire, and boy does it sound threatening when you can’t see where it’s coming from! We never saw any splashes, but the Navy did call us back at one point to verify our location and to tell us they’d let us know if we needed to move…! I told them we’d appreciate that. ha! Telling us to get lost! Thar she blows!!! We must have seen at least 50 whales on the trip down. When we first left Ketchikan we saw a couple of humpbacks in the distance and had a great view of a full breach – so awesome! Then when we were off the coast of Oregon working our way into Newport for fuel, we crossed a huge shelf area where the water was only 300-500’ deep. There were whales everywhere, feeding, frolicking, and just being whales!! 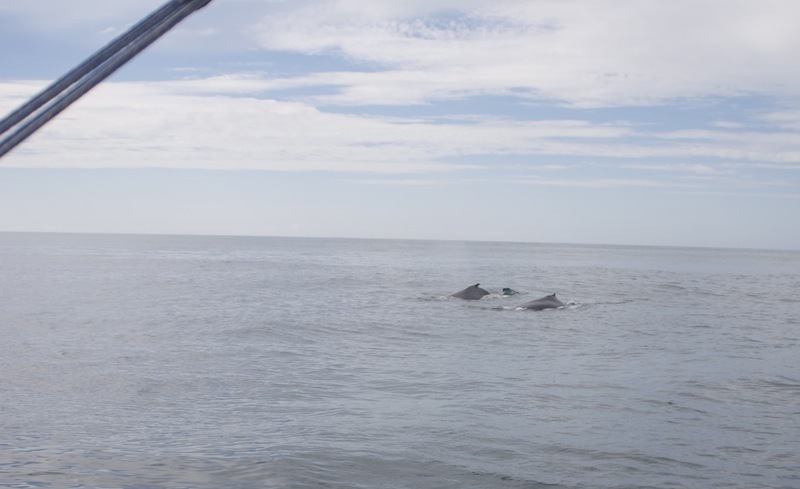 Two of the pods that we saw had calves with them, and the closest pod didn’t seem too thrilled at our presence. When we first saw them they were right off the bow in our way, so we cut off the engine and altered course away from them. As we floated along, they kept circling us so that we couldn’t get out of their path! 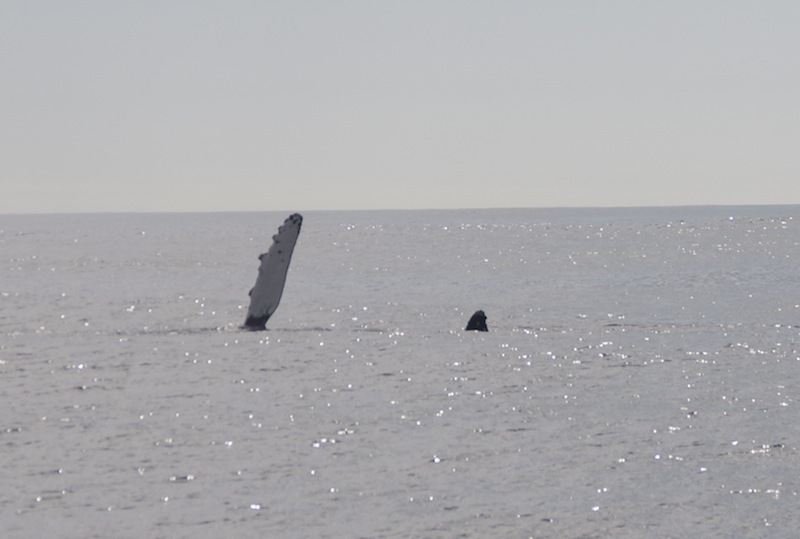 At one point the two males in the group lined up and headed straight for the boat, then one got close and started making loud whale calls and laying on his side slapping his pectoral fin toward us. The sound of their blows, their calls, the slap of their tales and fins…wow, did I mention it was amazing?? It appeared as though they were doing all this to protect the calf, as the Mom kept her body always between Happy Dance and the calf. Finally we drifted off far enough to be able to start the engine and give them more distance. We were “mugged” a couple more times over the next few hours by whales that were feeding so we kept having to turn off the engine to drift by them. 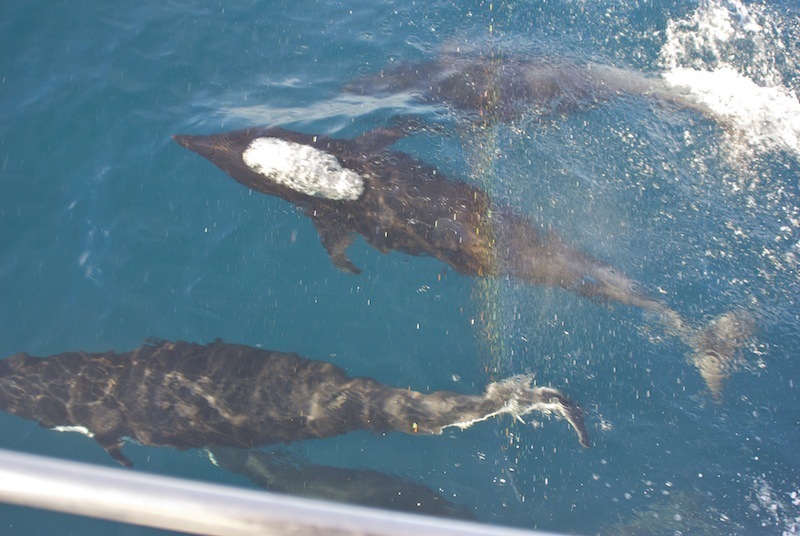 Northern Right Whale Dolphins doing the Happy Dance! areas of the Pacific, have much more slender bodies than dolphins you normally see from shore, they don’t have a dorsal fin so they look very sleek, they are mostly black with some white on their bellies, and they move like torpedoes – around 25 mph! Marty and I went up to the bow to watch them playing and it was a riot! There were about a dozen or more, and they would turn upside down under us as if watching us watching them! They kept jumping and diving and rolling over under the water…SO incredible! 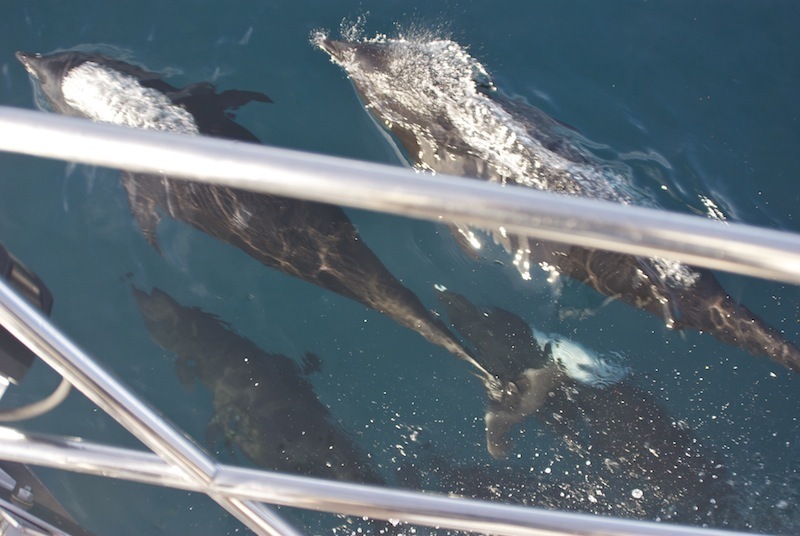 The second time we saw dolphins on the bow was when a smaller school of Pacific White Sided Dolphins showed up. They were so cute; smiling at us from under the bow. They would take turns moving into lead position, then falling back to the end of the pack, then moving up again…wild! Fish on! 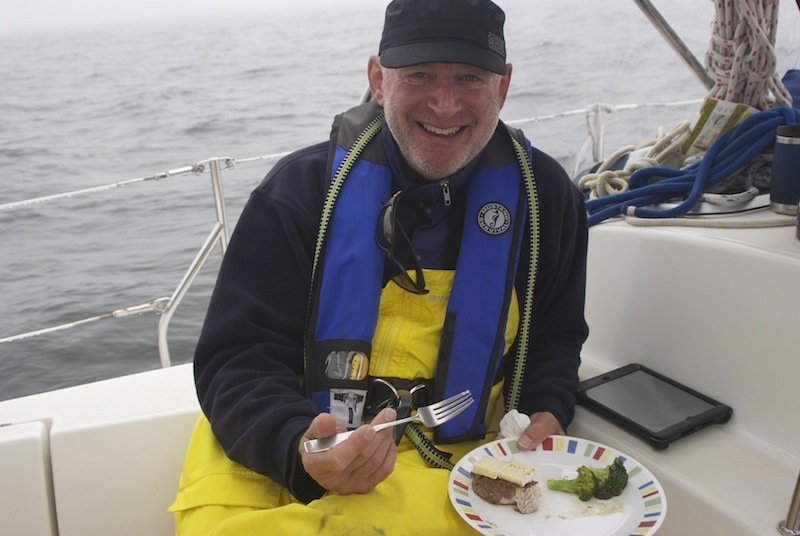 Before we left Ketchikan, our wagon master from the Sail Alaska trip, Jim Rard, showed us how to make a tuna rig. It’s about 150’ long, and is made up of 300-pound test twine, with a length of ½ inch surgical tubing inserted into a section. The twine is tied to each end of the surgical tubing so that you have a 3-foot section that will stretch to about 20-feet when a tuna is on! 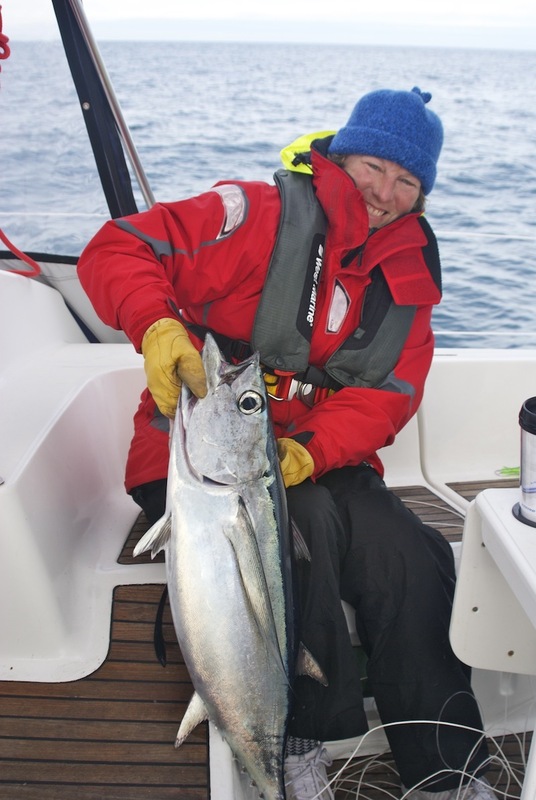 Add a lure to the end of all this, tie it to a cleat on the boat and voila – you have a tuna rig! Since we’re “trolling” at about 8 knots, the lure just skips along the top of the water behind the boat. Every now and then you look over to see if the surgical tubing is stretched out, and when it is…Fish on!! 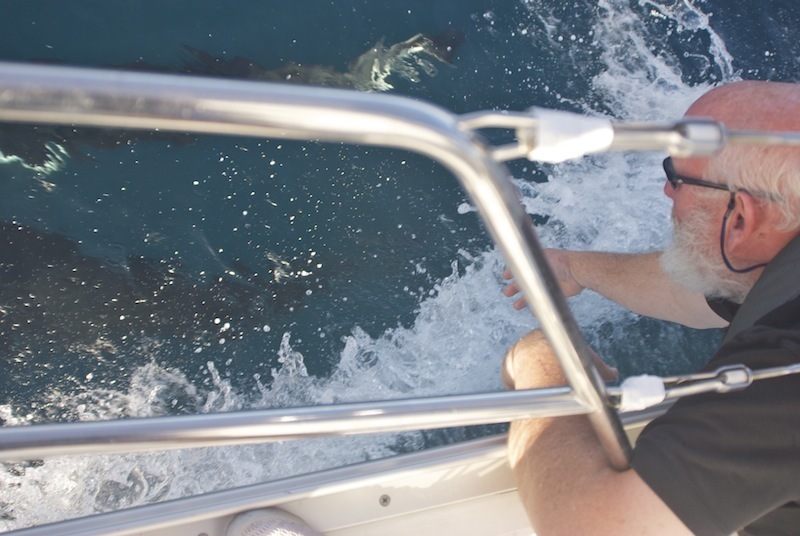 You hope to see the tuna along the top of the water, because if he dives down, it is much harder to get him onboard! Marty pulled in the line hand over hand, and then when the tuna got close it was one big pull and whoosh – he was in the cockpit! That’s when the real fun started, ha! Trying to keep him in the cockpit! We succeeded, and the freezer is full of YUMMY albacore steaks from the two tuna that we caught. put everything on a non-skid surface while you’re getting other stuff ready. Then light the stove and adjust the pan holders (these are very important so that your pans don’t slide off the stove onto the floor when a wave hits). Start cooking, and pretty soon it’s time to dish up! Figure out where everyone is sitting, and hand out the plates. 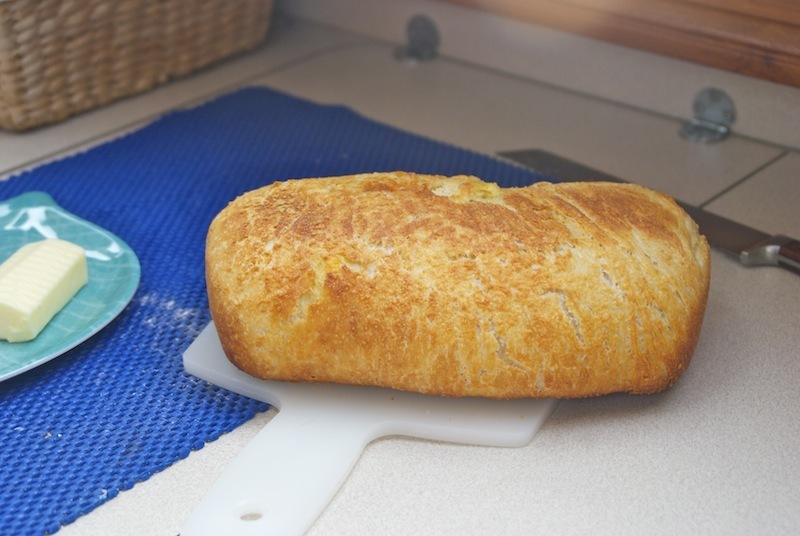 Some typical meals were home fries and eggs, fresh baked bread, lamb hash, tuna steaks with broccoli, chicken and wild rice, sandwiches, snack foods, and lots of hot perked coffee! Sleep, heavenly sleep! One thing missing on a long passage is a full night of sleep. For the first half of the passage we had 4 people on board, so we were able to each take two 3-hour shifts at the helm, with nine hours in between. This doesn’t mean that you actually slept while you were off shift, but you did get to try! 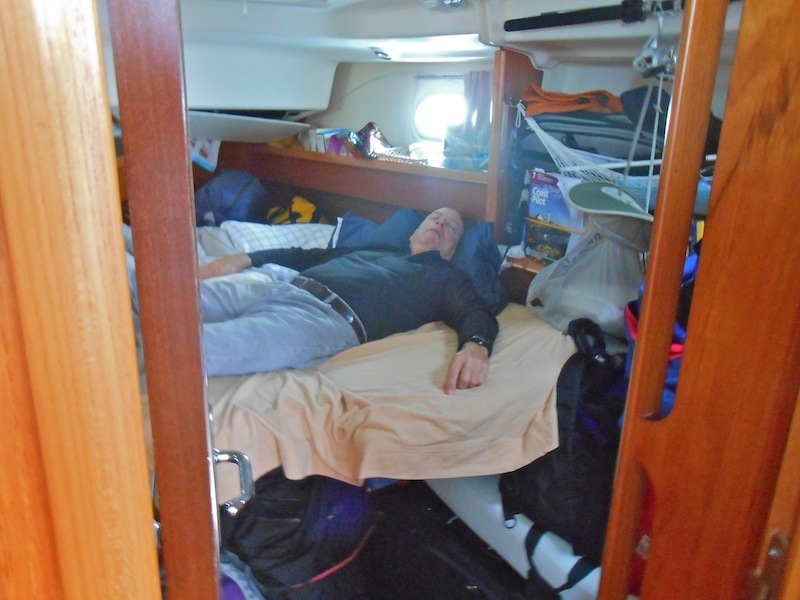 The boat was rolling and heaving so much for the first couple of days that it was pretty hard to sleep. Add in the sound of the engine, and it’s a challenge at best. Phyllis left us in Newport, so for the second half of the passage it was just Mike, Marty and myself, standing 4-hour watches, with 8-hours off in between. At one point I was literally nodding off while standing at the wheel. 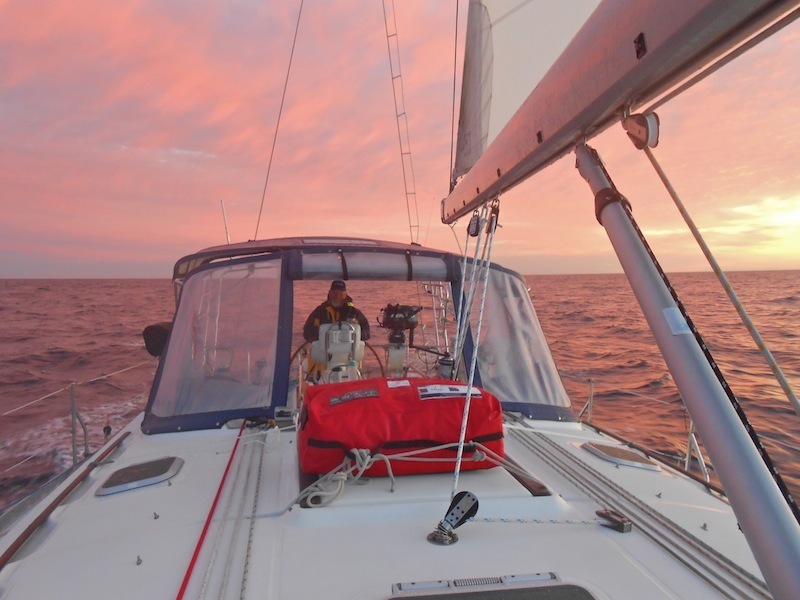 When out on the ocean it’s a constant physical battle to stay upright, even when sitting still. You also have to be mentally alert to everything around you; stay focused on the instruments, the engine, the boat, and the crew to make sure everything is running smoothly. It’s challenging, exhausting and thrilling! It’s a good thing/bad thing. Having smooth seas for the majority of a 1200-mile voyage in waters that are typically very turbulent is a VERY good thing. We left Ketchikan with the winds and seas blowing on our nose out of the south. We went as fast as possible to get out of the three major problem areas in Alaska and British Columbia that are just north of Vancouver Island. Once we were able to put Cape Scott and the Brooks Peninsula behind us, things settled down a bit and the winds clocked around to come out of the North, behind us. 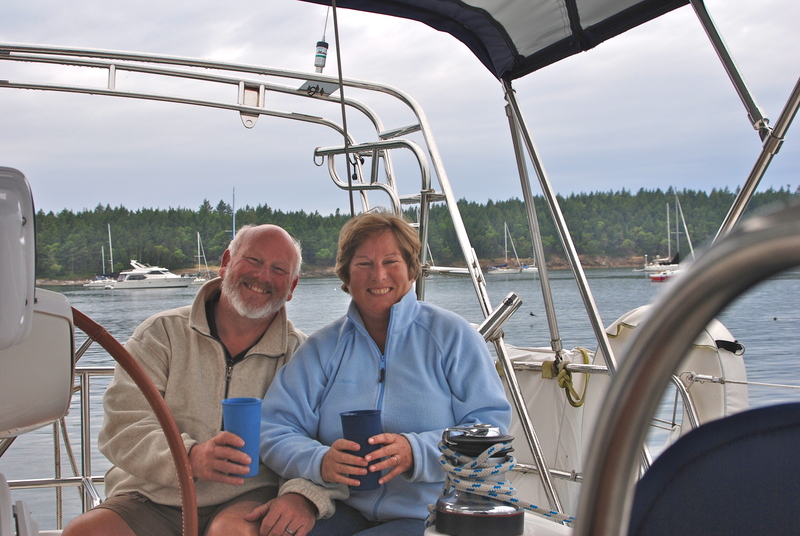 The winds were light, blowing 5-10 knots, so the sea state was incredibly smooth; a GOOD thing! 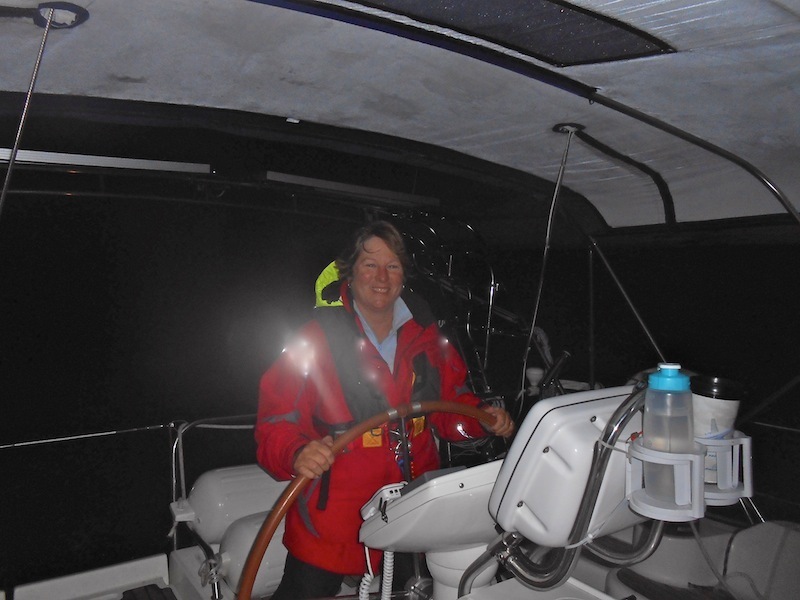 However, with such light winds that meant that we had to motor in order to keep our speed over 7 knots. We often had the sails up, to smooth out the ride and to give ourselves an extra push from the wind. 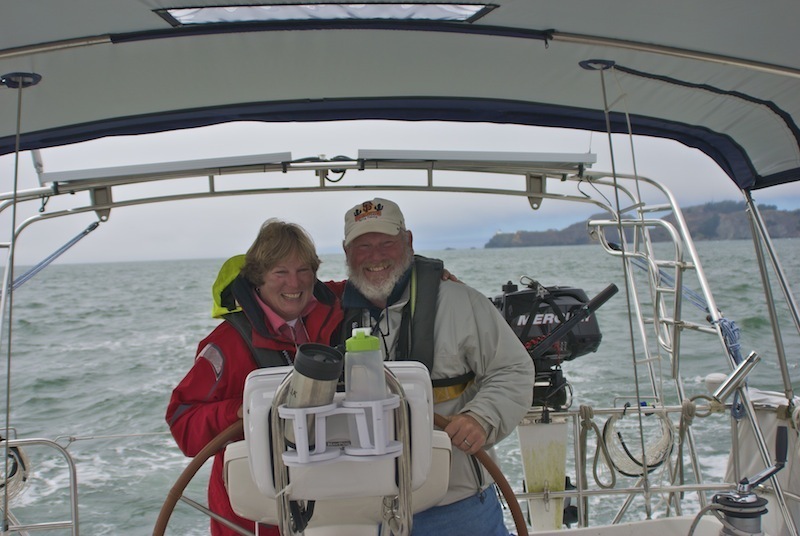 So that is what we did – we motored or motor-sailed (sails up, engine on) ALL the way from Ketchikan to San Francisco; 168.7 engine hours. The engine was only turned off for the three fuel stops, in Winter Harbor, BC, Newport, Oregon, and Crescent City, California. It would have been wonderful to have had winds blowing 10-15 so we could have put up the Gennaker (our asymmetrical spinnaker) with the goose on it and sail all the way south, but that would have brought much bigger seas along with it. So, all in all, the conditions made for an absolutely remarkable voyage. I see it!!! Turning that final corner and seeing the Golden Gate Bridge for the first time is a moment we’ll never forget. Sitting here trying to put it into words is difficult! Suffice it to say that there were tears of joy and plenty of happy dances! Add to that a stiff breeze, fog, lots of boat and freighter traffic, current and tide rips, and yes, even some humpback whales and dolphins near us heading out to sea…all this made for some very powerful emotions! Four hands on the wheel as we cross under the Golden Gate! Wonderful, fantastic, dreamy! I am so happy for you two and your adventures. Thank you so much for sharing them in such a compelling yet delightful way! I loved this entry and can’t wait to read more of your blog. Keep sailing, writing and most of all, dancing! Hi Cheryl! Good to hear from you – hope we see you again down here in the sunny latitudes!! Oh, Marvelous!!! I sang it very loud to Brian! haha!!! Thanks Janet – you are a riot! Can’t wait to see you . This is so cool you guys, thanks for taking me along! Where to next? Hi Geoff! Thanks for the note. 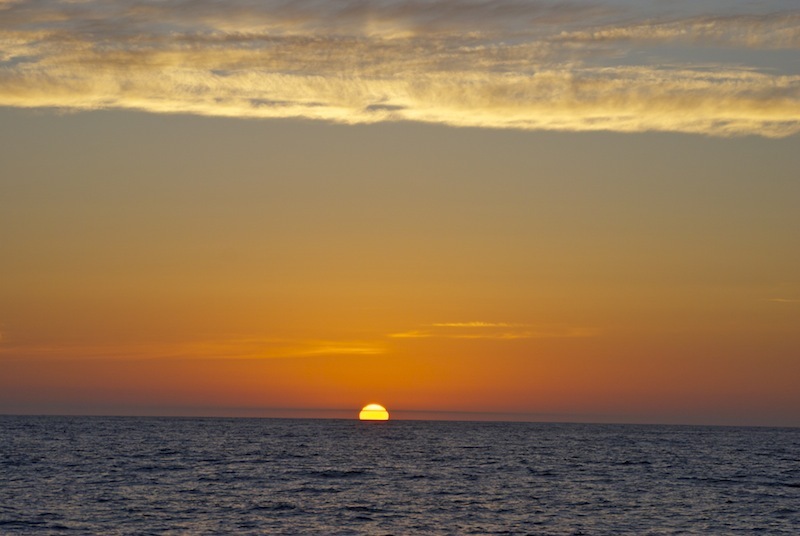 We’re still heading south – Cabo San Lucas is the next big stop! oh yeah, forgot to mention your clever little ditty – you guys crack me up! FANTASTIC! an exciting post to read and even more exciting to have lived it. Even tho’ I know you made it, the close encounters were well told and had me sitting a little straighter in my seat until you made it safely thru’ – wildlife sightings must be thrilling and I know there was a lot of hooting and hollering when ever you saw something. There must be tons of photos on your memory card by now. Can’t wait to see more. Thanks for getting us, safely, from Ketchican to SF Bay. The rest of the voyage is yet to come and I am ready. Congrats to all for a successful, memorable voyage. Hootie Hoooooo.